Computer simulation is a widely accepted tool for design of induction coils and other components of induction systems, for development of new processes and equipment, for troubleshooting and for teaching and learning. Multiple programs and packages are being used for these purposes, from “home-made” programs to multiphysics packages such as Comsol, Ansys or Flux. One of the first questions, asked by new users, is: “How accurate are the results?". The author has long experience in computer simulation and design of various induction systems and understands well that there is no simple answer to this question. This presentation is an attempt to discuss the sources of inaccuracies and provide information on what the user must pay attention to. It may be useful for the software users and developers as well as for all users of induction heating. The study is related to induction heating itself, i.e. to electromagnetic and thermal processes with much less attention to other processes. Simulation of structural transformations, stresses and deformations as well as electromagnetic forces and magnetohydrodynamic processes are not considered in this presentation. Induction heating is used in many technologies that usually include multiple physical processes and material transformation. The core processes are electromagnetic and thermal which may be followed by phase or structural transformation, additional mechanical processes (rolling, forging, pinning), etc. A scheme of processes in heat treating of machined parts is shown in Fig. 1. Majority of induction-oriented programs allow the user to simulate only few mutually coupled processes, e.g. electromagnetic (EM) and thermal (TH). The most effective even if more challenging, is computer simulation of the whole technological chain [1,2] using multiphysic programs or a set of programs. For example, program Flux 2D/3D allows simulating EM and TH processes with relatively simple supplying circuitry and possibility to move the coil position relative to the part (scanning with step-variable speed). It is obvious that multistage simulation may be less accurate if there is no intermediate control and corrections. Only the most traditional processes of induction heat treating are considered in this presentation, i.e. EM and thermal. A question about the simulation accuracy can't be answered in a simple way, because different criteria and norms are being used in different cases. There are specific difficulties in defining accuracy of simulation of the induction processes. One of them is a different type of compared objects. They may be numbers (such as power or heating time), continuous 1D, 2D and 3D functions, varying in time or space. The other problem is an uncertainty of experimental data and limited direct access to some values, such as internal temperatures. Other values can't be measured during processing, e.g. internal stresses. A problem of accuracy is closely linked to optimization of designs and processes, which requires a formulation of criteria and comparison of "nearness" of the results at different steps . Accuracy is the nearness of a calculation to the true value. Common definition associates accuracy with systematic errors and precision with random errors, typically distributed according to a normal distribution law. For each particular case and model, a simulation is precise in sense of stability of the results but not accurate. Experiments are not precise and not quite accurate. 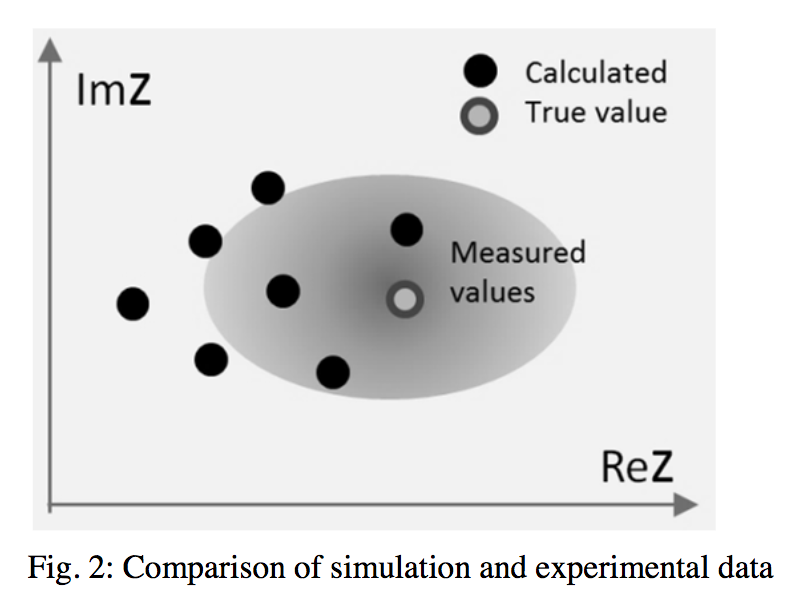 Comparison of calculated and measured data for a very simple case of the furnace impedance, presented in a form of a vector ReZ + jImZ, is given on Fig. 2. Black dots represent results of simulation using different programs or input data. It is clear that an error may be small or big, depending on the program used, calculation procedure and reliability of the experiment. For matching purposes it is sufficient to be sure that the calculated coil impedance is within a rated load range of the power supply. For the user of induction machine, a criterion of the simulation accuracy may be a correspondence of predicted hardness pattern to the measured or specified pattern allowance. Inaccuracies of computer simulation can be caused by multiple factors and can appear at any step of simulation. Possible sources of inaccuracy for a typical chain of induction simulation are presented on Fig. 3. Considered processes may not cover all the processes occurring inside the induction system that can influence the results of simulation. For example EM + Thermal simulation of one-side heating of a flat body does not take into account the part deformation which can strongly influence the coil parameters and power distribution. Another important factor is a mode of energizing the induction system. The most common mode is an application of known current or currents to the system input (inputs). A program Elta  in addition to traditional modes of current or voltage values on the coil or generator terminals has modes of known power or specific power on the part surface. The latter mode allows the modeler to design and optimize the process without detailed design of the coils. Elta has also a unique option of the heating process simulation with automatic adjusting of frequency, which is a common case in practice. System Geometry is one of the most important sources of inaccuracy. The modellers always try to avoid 3D simulation, describing the system as 2D, in order to simplify their job and reduce processing and analysis time. However, it is necessary to state that almost all induction systems are 3D. Even simulation of traditional multi-turn solenoidal coils as a set of parallel plain turns can lead to significant errors when number of turns isn't big. This issue is a technical problem too. There are three types of multiturn coils: a) simple helical coils, Fig. 4; b) helical coils with “equilizers” (wedge-like pieces of copper brazed to extreme turns in order to make the ends parallel); c) coils with “plane-parallel” turns with axial connections between them, often called "dog legs". It looks like the latter design is completely 2D, but dog leg connections increase an angular distance between the leads, which can significantly influence the coil parameters and the technological effects, especially in the cold crucible melting furnaces. The "global" 3D effects in the cold crucible furnace can result in excessive skull thickness in the lead area and even cause unintended melt rotation. 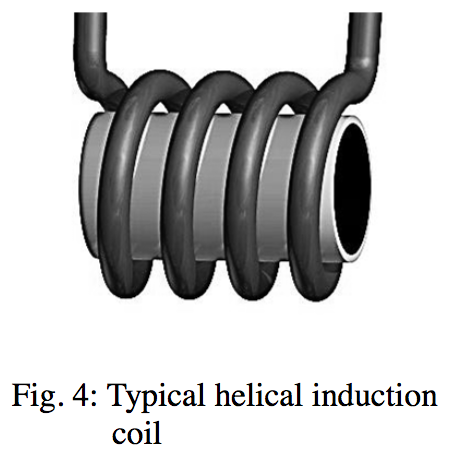 Helical and some other "supposed-to-be 2D" coils can induce longitudinal voltage in the part. If the part is longer than the coil and has connection to the "ground" (such as driving rolls, Fig. 5), it can result in significant induced current Ig thru the ground and in technological effects, which can't be simulated with 2D approach. These effects are usually negative because of undesirable heating, power loss, sparking and fast wearing of the roll bearings, but sometimes the “ground currents” can be used intentionally for additional selective heating. Phenomenon of “ground current” is known in practice but the author did not meet any publication about simulation of this subject. Even single turn cylindrical coils have 3D zones in the lead area. 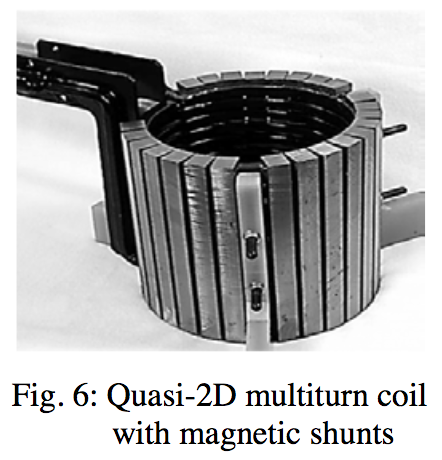 Application of magnetic controllers (shunts, concentrators) can significantly reduce or eliminate 3D effects in single- and multiturn coils, Fig. 6. In general, neglecting of the lead zone in many cases can lead to big errors. Material Properties are another major source of inaccuracy especially in the case of magnetic materials. Temperature dependence of physical properties for majority of materials that are not intended to work at high temperatures, aren’t easy available. For example, the author found that the best source of specific heat capacity of carbon steels in wide range of temperatures is more than 80 years old but it is still much demanded . For accurate simulation of steel heating we need to take into account not only chemical composition but also their structure (annealed, hardened, etc.). There is one more factor that typically isn’t considered. It is well known that in forge heating the surface of steel oxidizes forming a scale layer. This reaction is very exothermic and ideally it must be taken into account. Reliable and accurate description of magnetic properties is much more complicated. In some programs (Quick Field, Ansys, etc.) permeability is supposed to be constant. It can lead to an error around 30% in value of absorbed power for a given field strength on the part surface [6,7]. In majority of other programs used for induction heating simulation, “frequency domain” approach is being used [6,8]. In this case permeability is supposed to be constant during the field half period but its value is being calculated as a function of the field rms or amplitude. This approach can give “technically correct” power value but does not allow accounting for hysteresis or higher harmonics in “linear” parameters (field strength, flux density, current and voltage). Experimental tests and adjustment of simulation and design procedure cntinue until now . “Time-domain” approach is based on simulation of EM "transient” processes during each period of the field wave. 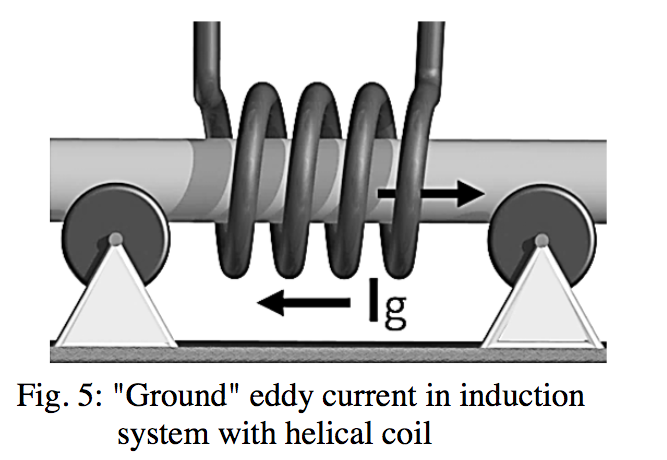 Though attempts to simulate eddy-currents problem in magnetic bodies have been made around 60 years ago , the time-domain approach isn’t used in common practice of induction heating. We can expect that with powerful modern computers we can return to this approach for more accurate simulation. Here μrt is permeability at room temperature. Lower values of n correspond to higher permeability and therefore lower field strength. Simulation experience showed that zebra effect takes place only when value of n in equation (1) is high, probably above 16. It explains why this effect appears more often in high frequency hardening when the field strength is much lower than at the low frequency hardening. 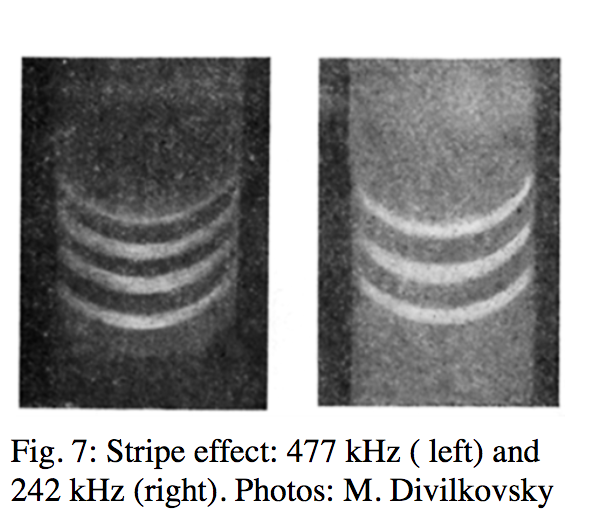 To opinion of the author, zebra effect is caused by EM end effects on the plane of contact of magnetic and partially non-magnetic pieces of the part . More simulation tests with experimental validation are necessary for complete explanation and prediction of this effect. It is desirable to perform time-domain simulation. Simulation type and method. It is difficult to compare accuracy of different simulation types and methods. Some considerations about Time Domain and Frequency Domain simulation of magnetic material processing had been presented above. By means of Time Domain simulation of heating magnetic materials, it is possible not only to obtain more detailed and accurate information about the electromagnetic processes but also validate and possibly improve the Frequency Domain method. Algorithm of calculations and post-processing can significantly influence the program accuracy. Special attention must be paid to the algorithm and processing setting in simulation of strongly non-linear tasks such as impulse hardening or intensive quenching, otherwise the calculation can non converge or be completely incorrect. Post-processing is very important for evaluation of the results using selected criteria of accuracy. Computer simulation is a powerful tool for study and design of induction heating systems, but it isn't quite accurate. Incomplete or incorrect description of the system geometry and of a set of processes can result in big errors. There are still problems in simulation accuracy due to a scarce database of the temperature and field dependent properties of steels and due to insufficient study of the magnetic material characterization (account for hysteresis losses, “equivalent” permeability calculation in harmonic approach, etc.). Accuracy depends on many factors including the problem formulation, correctness of the input data, used program and experience of the modelers. It is very important that the modeler knew physics and practice of induction heating as well as assumptions and limits incorporated into the used software. The modeler should make "credibility evaluation" at each step of simulation (model construction, accuracy of input data, distribution of calculated EM field, power and temperature) in order to improve accuracy and avoid mistakes. Alternative simulation and experimental data can provide final or additional credibility to the obtained results. For each particular area of application it is useful to create a data or even knowledge base that can help to implement the best simulation practice. Properly made simulation of induction heating may be effectively incorporated into the whole simulation and optimization chain of the product manufacturing [2,12]. Support from Fluxtrol, Inc., USA, and kind advices of colleagues from different countries are gratefully acknowledged. A. Muelbauer (2008), History of induction heating and melting, Vulkan-Verlag, 2002 p.
 Jun Cai, et al. 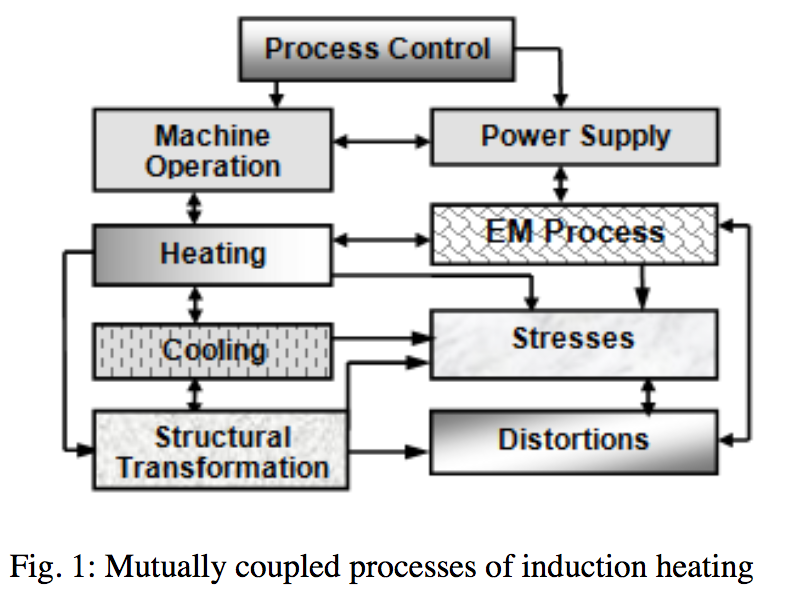 (2003), Integration of induction heat treat simulation into manufacturing cycle, J. Heat Treating Progress, v.3 no.2. E . Ya. Rapoport, Yu.E. 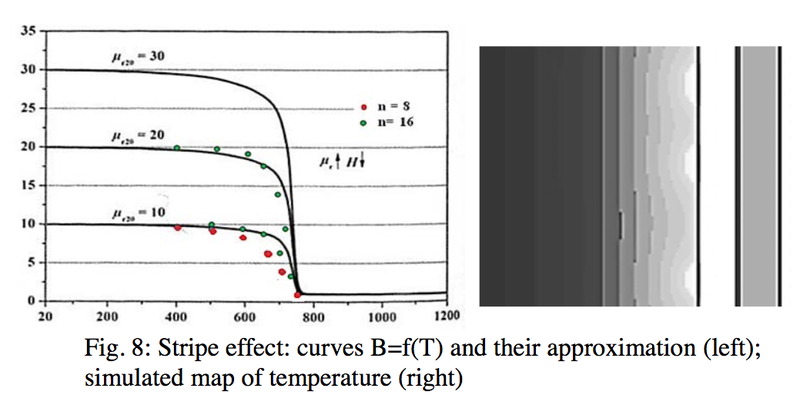 Pleshivtseva (2007), Optimal control of induction heating processes. CRC Press, 348 p.
 B.L.Ferguson et al. (2013), Modeling stress and distortions of full-float truck axle during induction hardening, Proc. of HES 2013, Padua, Italy.